The SJO is thrilled to have started bringing weekly music education to Colin L. Powell Academy, which is just on the border of Long Beach and Compton! With the addition of Colin Powell Academy, the SJO’s Music in the Schools program is in 12 schools and 170 classrooms, reaching over 3,700 students each week! 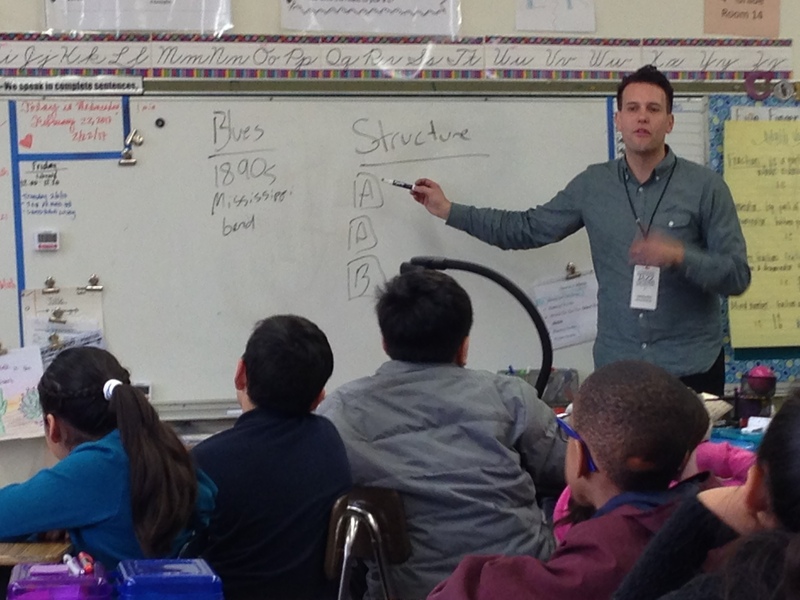 Above, SJO Teaching Artist and jazz bassist Alex Boneham teaches 5th graders about the AAB structure of the Blues, as the students prepare to compose their own blues songs. This class is part of the SJO’s “Music in the Schools” weekly Bach to Bebop residency, which helps students gain knowledge and an understanding of music — from baroque through bebop. At the close of the school year, students perform the blues songs they composed during the residency at a school-wide assembly.